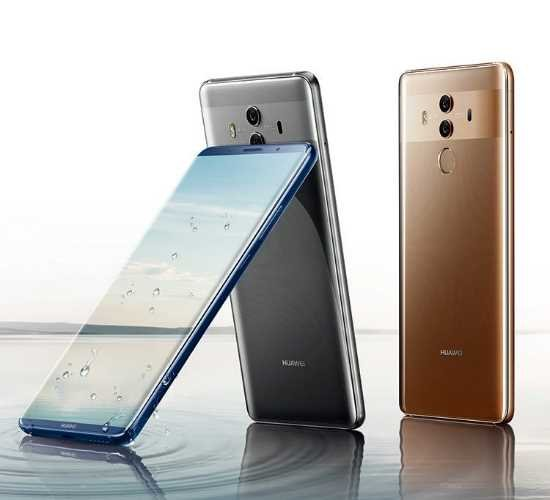 The Huawei smartphone range has something for all tastes and budgets and in our Huawei Mate 10 Pro review, we take a look at one of the high-end offerings from this manufacturer. The first thing you notice on this smartphone is the big 6-inch display, with almost no bezels the viewing experience is superb on this handset. The handset has a glass back and front and the curve of the back panel makes it feel really good to hold. There is a section of brushed metal on the back, this is where the dual camera lenses sit. The phone comes in Titanium grey, Mocha Brown and Midnight blue. Weighing in at 178g the phone feels solid but not too heavy and at just 7.9mm thick it is slim. Underneath the big 6-inch display, the Huawei Mate 10 Pro has the world’s first Kirin AI processor. This delivers impressive efficiency and responsiveness. The AI platform has a dedicated Neural-Network Processing Unit (NPU), this makes for blazing speeds and excellent multitasking. The octacore processor is a 2.36GHz unit and there is a 12-core Graphics processor unit too. This all works together with the AI feature learning as you use the phone and it makes changes to settings and predicts future usage. There is a fingerprint sensor on the back of the phone, this can be used for unlocking the device or to perform different tasks such as answering calls or activating the camera shutter. The latest Android Oreo is on board and this works with the EMUI 8 from Huawei. This delivers features such as Pocket PC for a full desktop experience by connecting a monitor, keyboard and mouse. The Translator feature can translate voice, text and conversations in more than 50 languages. The battery on the Huawei Mate 10 Pro is a large capacity 4,00mAh unit, this delivers a full day of use even for the heaviest phone users. The Smart Power Management feature will learn user behaviour and allocate resources efficiently for making the most of the available power. There is a SuperCharge cable included on the box, this gives a full day of battery power from a quick 20minute charge. The camera on the Huawei Mate 10 Pro is another outstanding feature on this device, the dual lens Leica Camera gained a 97 out of 100 score from DxOMark. This is just one point below the Google Pixel 2, which was rated the best smartphone camera in the world. The setup consists of a 20-megapixel monochromatic lens and a 12-megapixel RGB camera, the images captured by both lenses are combined for simply stunning photos. The two-lens configuration allows for lots of real-time effects and a huge range of post editing options. Real-time recognition will spot certain objects in the shot and adjust settings to suit. 2x Hybrid Zoom and Bokeh effects are also featured. Wide Aperture Mode allows you to choose a certain focal point, even in a large crowd. 4K video, 3D panoramas and Light Painting Mode are all on board and the 8-megapixel camera includes Portrait Mode and Perfect Selfie beauty options. The superb performance thanks to the new AI processor and excellent photography results make this phone worth considering. The experience is quality throughout every aspect of the Huawei Mate 10 Pro and the camera is the perfect choice for anyone that loves sharing photos on social media. What do you think of the Huawei Mate 10 Pro?Would you buy it? Share your thoughts below or join the conversation on Google+.